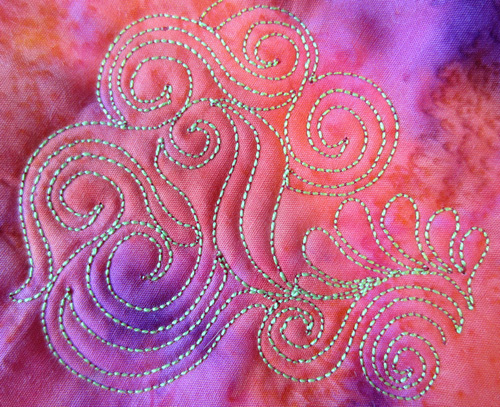 Quilt artist Teri Lucas shares tips for stitching free-motion bobbin work. Visit Teri at terificreations.wordpress.com. And thankfully BERNINA knows we like to break “the rules” and gives us options for doing so. 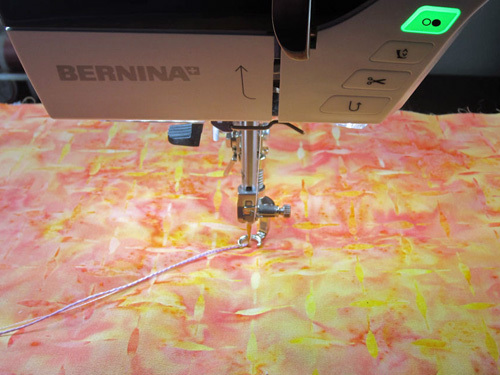 When I quilted on my BERNINA 1080/1090 I would loosen or tighten the screw on the bobbin case as needed it to get just the right tension for the thread being used in the bobbin. 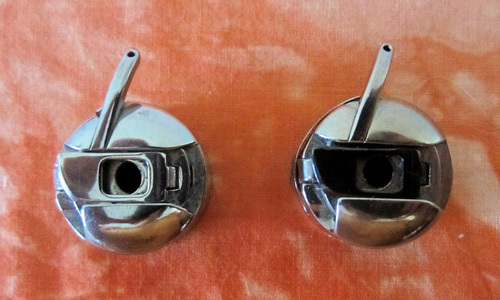 I later learned that the BERNINA Black Latch Bobbin Case is designed for bobbin work, with a longer screw giving us even more freedom to play. I purchased that puppy the day I learned about it. Tip: It’s a good idea to loosen the screw holding the bobbin inside a small plastic or paper bag just in case the “lefty loosey” goes wild and the screw pops out. It’s hard to find after it falls on the floor! Then the 7 Series came out with a BIG bobbin that holds a LOT of thread. (Thank you BERNINA!!) And once again we quilters put the call out to BERNINA for a bobbin case that would give us the same freedom to play. BERNINA answered with the Red Bobbin Case. Let me say I love that it’s red, making it so easy to identify. When I know I’m going to be playing with heavier thread I look for the Red. This bobbin case gives us the ultimate freedom – there is no tension screw/spring. All tension is controlled from the top. It comes with a threader for those particularly heavy decorative threads we like to play with. Think heavier embroidery floss, perle cotton, ribbon. This is a good time to hand wind your thread (ribbon, floss) onto the bobbin. Just make sure whatever you’re using for bobbin work is wound on properly. Please do not try to wind on using the bobbin winder! It doesn’t work, trust me. The thread or floss can untwist in a most unseemly manner. The BERNINA Red Bobbin Case comes with a threader to guide the thread into the proper position. 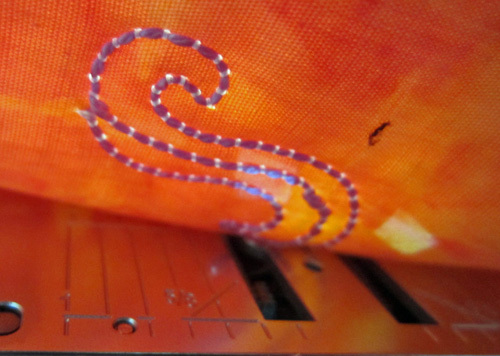 For the top thread on this particular project I chose to use a 40 trilobal polyester thread. When working with unusual bobbin threads, polyester is my go-to needle thread as cotton tends to grab and pull. The 40 weight is just perfect for the top; it’s finer than anything used in the bobbin. Using a 90/14 Topstitch (suited for the weight of the thread), the straight stitch plate and the BERNINA Stitch Regulator, I got stitching. Practice on a few smaller pieces before tackling a larger piece. 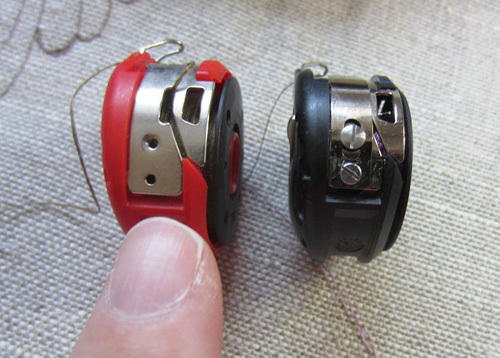 Pull the bobbin thread to the top when starting, as this will prevent thread from nesting. It may take a little effort to do this but it will be worth it. 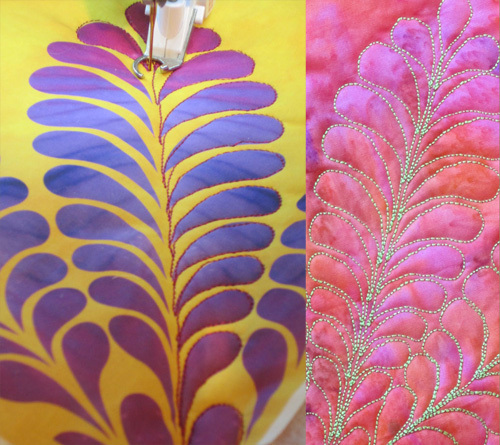 Use fabrics with printed patterns on the back to use as guides for stitching. Marking tools like stencils and pounce powder will help. 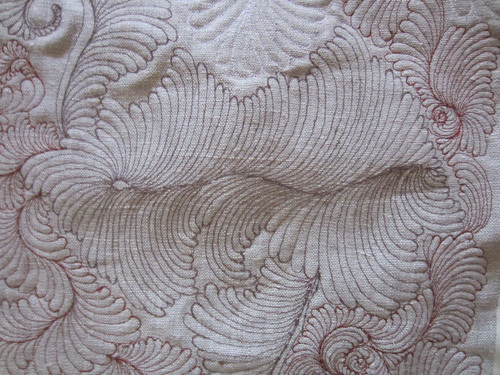 On large pieced quilts, stitching in the ditch helps define all of the spaces to be quilted. Stitching this “grid” before adding bobbin work will make a huge difference. 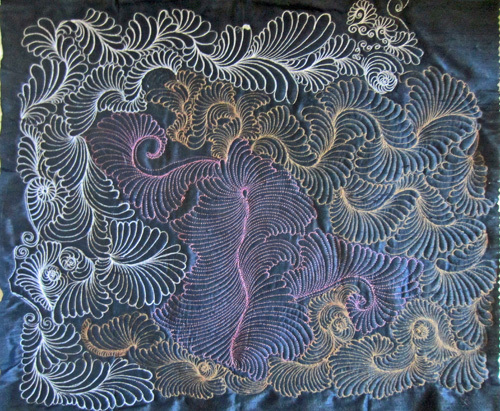 I might use bobbinwork on the front of a blouse or perhaps on a quilt block.